Tonight the Pirates finished off a sweep of the Houston Astros, their first in Houston since 1991. The 5-4 victory was fueled by Jose Bautista, who was 3-5 with 3 RBI's. The Astros led 3-1 through four innings, but with the help of some miscues by Houston's defense, the Bucs rallied in the 5th. After Ronny Paulino hit a 600 foot RBI double to center, Xavier Nady lifted another fly ball to center. Chris Burke misplayed it, leaving runners at 2nd and 3rd. Bautista, who had plated a run with a double in the 2nd, followed with a single to center. Paulino and Nady scored, and the Pirates took a 4-3 lead. After Tom Gorzelanny walked, more errors burnt the Astros. Adam Everett booted a Chris Duffy groundball, then kicked it even farther away for a second error, allowing Bautista to score. 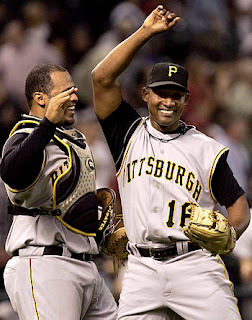 The Pirates' bullpen again was dominant, holding the Astros scoreless until Craig Biggio's two-out homerun in the 9th. I was encouraged by Gorzelanny's outing. He was hurt by some cheesy hits and shoddy defense, which allowed a couple runs to come across. Also, he appeared to have Carlos Lee struck out in the 1st. The pitch was called a ball, and Lee followed with an RBI single. All in all, he looked good. That was a very sloppy game tonight. Five errors, fly balls dropping in all over the place, Gorzelanny was hit on an 0-2 pitch and later walked, and nothing seemed like a sure out. Oh well, it worked out in the end. Jose Castillo is thinner. His defense looks better. But he still has the same lousy approach at the plate. It seems that every time he bats, he swings and misses on a first pitch breaking ball. Because he's trying to yank it over the leftfield fence. I think Jose Bautista's job is safe when Freddy returns. Speaking of Bautista, he played a great game tonight. He had an excellent day at the plate, and also turned in a stellar defensive play on a rocket off the bat of Carlos Lee in the 5th inning. It would be nice to have that kind of production continue throughout the season. This game turned in the bottom of the 4th inning. Gorzelanny nearly escaped a bases loaded, no out situation unscathed. He did allow one run to cross with a bases loaded hit-batsman, but this inning could have been far worse. Early on, this team is looking suspiciously like the one we saw after the All-Star break in 2006. There's nothing spectacular happening, just solid pitching and situational hitting. And that is translating into wins. Let's hear from Jim Tracy on this topic: "37-35, 37-35, 37-35, 37-35, 37-35, 37-35, I'm awesome, 37-35, 37-35, 37-35, 37-35, 37-35, I am 3-0 so far, 37-35, 37-35, 37-35, you see what happens when people listen to me? 37-35!" Thanks for the input, Jim. I wish someone would have focused the lens on FSN's centerfield camera. It only took a few days for ESPN to notice the Pirates. Suddenly we're on our way up? This is more fun than the start to 2006.